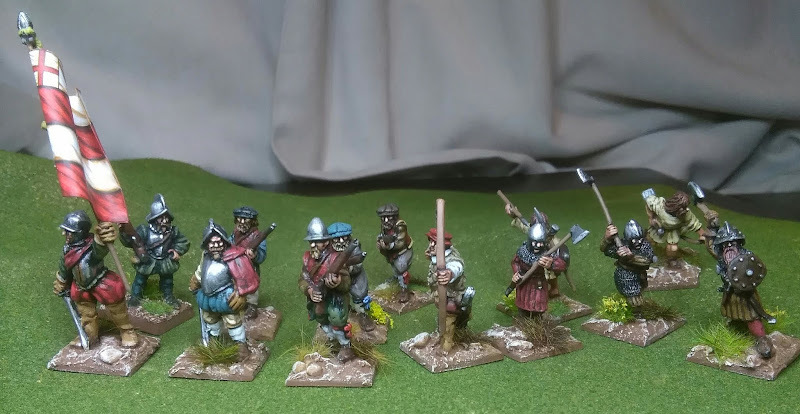 Finished a few more figures for the Elizabethan Ireland Project, see what you think. Really nice figures. I love the richness of the colours your have used. They look great. What range do the Perry Irish figures come from? Very cool. Reminds me of scenes from the Hollywood melodrama, "Elizabeth and Essex." Not a lot of action, but the scenes of Errol Flynn and the English taking on Alan Hale and the Irish made me curious about this period of history. Perry added Irish in their War of the Roses range, about 8 packs. thanks for the comments as above the Irish are from the Ears of The Roses range and recently added, there are 6 packs i THINK, HOPING TO PICK THEM UPIN A COUPLE OF WEEKS. I thin it lends itslef to large skirmishes and raids.